An antique map 'Drawn & Engraved by J. Archer, Pentonville, London. Published by William Mackenzie Glasgow, Edinburgh & London. Circa 1860 with original colouring. 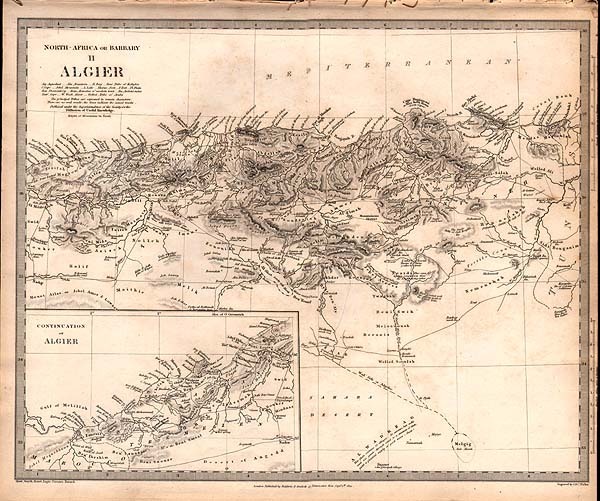 A map of Algiers and Parts Adjacent which appeared in "The Gent." magazine in 1740. 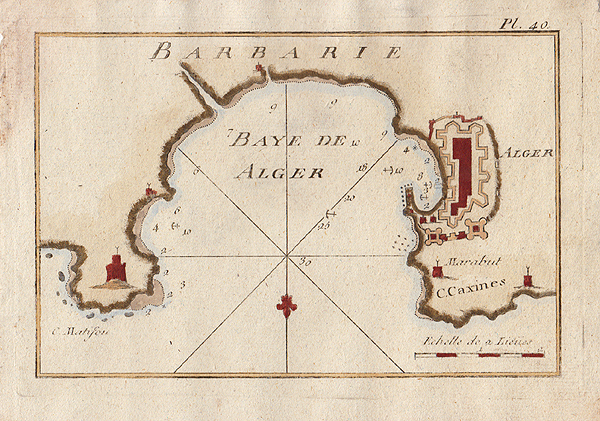 It shows The Bay of Algiers and has a key to identify relevant locations. Shows several castles, villages and two large native birds the Boo-ank and the Hou-baara. 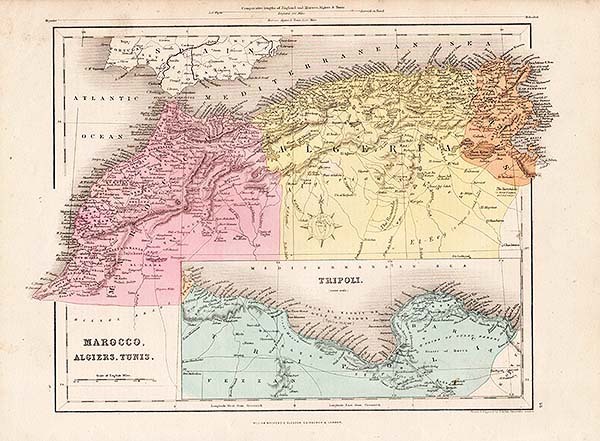 North Africa or Barbary II Algier. S.D.U.K. More Info An antique map by Shaw, Smyth, Rozet, Lapie, Garnier and Berard and engraved by J. & C. Walker of the region from the Desert of Angadd to Nemenshah with inset of the coast from Magrowah to the Gulf of Melillah. Published under the Superintendence of the Society for the Diffusion of Useful Knowledge by Baldwin & Cradock, 47 Paternoster Row, Septr. 1st. 1834. An antique map by Shaw, Smyth, Rozet, Lapie, Garnier and Berard and engraved by J. & C. Walker of the region from the Desert of Angadd to Nemenshah with inset of the coast from Magrowah to the Gulf of Melillah. Published under the Superintendence of the Society for the Diffusion of Useful Knowledge by Baldwin & Cradock, 47 Paternoster Row, Septr. 1st. 1834. Barbarie, Bone and Port Geneves. More Info This sea chart shows Bone (Annaba) Algeria and Port Geneves. The chart shows depth soundings and anchorage points. The chart shows depth soundings and anchorage points. Published in "Recueil de 163 des principaux Plans des Ports et Rades de la Mediterranée, dont 40 ont été derniérement publiés par Jean Joseph Allezard ancien Capitaine de Marine. Gènes: Yves Gravier, 1804. "- an atlas which contains strongly engraved copper plate plans of ports and harbors around the Mediterranean. Later coloured by hand. Has many worm holes. 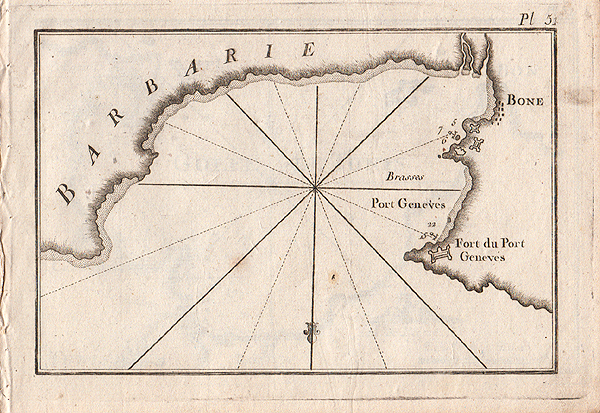 This sea chart shows Bone (Annaba) Algeria and Port Geneves. The chart shows depth soundings and anchorage points. The chart shows depth soundings and anchorage points. Published in "Recueil de 163 des principaux Plans des Ports et Rades de la Mediterranée, dont 40 ont été derniérement publiés par Jean Joseph Allezard ancien Capitaine de Marine. Gènes: Yves Gravier, 1804. "- an atlas which contains strongly engraved copper plate plans of ports and harbors around the Mediterranean. Later coloured by hand. Has many worm holes. More Info This sea chart shows Bone (Annaba) Algeria and Port Geneves. The chart shows depth soundings and anchorage points. The chart shows depth soundings and anchorage points. Published in "Recueil de 163 des principaux Plans des Ports et Rades de la Mediterranée, dont 40 ont été derniérement publiés par Jean Joseph Allezard ancien Capitaine de Marine. Gènes: Yves Gravier, 1804. "- an atlas which contains strongly engraved copper plate plans of ports and harbors around the Mediterranean. Later coloured by hand. 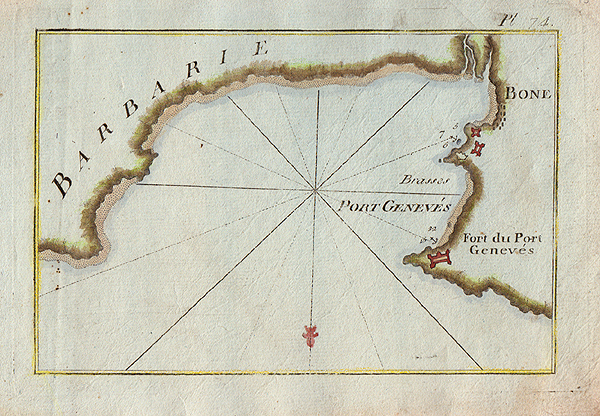 This sea chart shows Bone (Annaba) Algeria and Port Geneves. The chart shows depth soundings and anchorage points. The chart shows depth soundings and anchorage points. Published in "Recueil de 163 des principaux Plans des Ports et Rades de la Mediterranée, dont 40 ont été derniérement publiés par Jean Joseph Allezard ancien Capitaine de Marine. Gènes: Yves Gravier, 1804. "- an atlas which contains strongly engraved copper plate plans of ports and harbors around the Mediterranean. Later coloured by hand. More Info This sea chart shows the coast of Algeria in the vicinity of The Bay of Algiers, Cape Matifou and Cape Caxine. The chart shows depth soundings and anchorage points. The chart shows depth soundings and anchorage points. Published in "Recueil de 163 des principaux Plans des Ports et Rades de la Mediterranée, dont 40 ont été derniérement publiés par Jean Joseph Allezard ancien Capitaine de Marine. Gènes: Yves Gravier, 1804. "- an atlas which contains strongly engraved copper plate plans of ports and harbors around the Mediterranean. Later coloured by hand. Has many worm holes. This sea chart shows the coast of Algeria in the vicinity of The Bay of Algiers, Cape Matifou and Cape Caxine. The chart shows depth soundings and anchorage points. The chart shows depth soundings and anchorage points. Published in "Recueil de 163 des principaux Plans des Ports et Rades de la Mediterranée, dont 40 ont été derniérement publiés par Jean Joseph Allezard ancien Capitaine de Marine. Gènes: Yves Gravier, 1804. "- an atlas which contains strongly engraved copper plate plans of ports and harbors around the Mediterranean. Later coloured by hand. Has many worm holes. More Info This sea chart shows the coast of Algeria in the vicinity of The Bay of Algiers, Cape Matifou and Cape Caxine. The chart shows depth soundings and anchorage points. The chart shows depth soundings and anchorage points. Published in "Recueil de 163 des principaux Plans des Ports et Rades de la Mediterranée, dont 40 ont été derniérement publiés par Jean Joseph Allezard ancien Capitaine de Marine. Gènes: Yves Gravier, 1804. "- an atlas which contains strongly engraved copper plate plans of ports and harbors around the Mediterranean. Later coloured by hand. This sea chart shows the coast of Algeria in the vicinity of The Bay of Algiers, Cape Matifou and Cape Caxine. The chart shows depth soundings and anchorage points. The chart shows depth soundings and anchorage points. Published in "Recueil de 163 des principaux Plans des Ports et Rades de la Mediterranée, dont 40 ont été derniérement publiés par Jean Joseph Allezard ancien Capitaine de Marine. Gènes: Yves Gravier, 1804. "- an atlas which contains strongly engraved copper plate plans of ports and harbors around the Mediterranean. Later coloured by hand. Vue du Golfe d'Arzeou ou Arzeni"
More Info This sea chart shows Golfe d'Arzeou ou Arzen, Algeria. The chart shows depth soundings and anchorage points. Published in "Recueil de 163 des principaux Plans des Ports et Rades de la Mediterranée, dont 40 ont été derniérement publiés par Jean Joseph Allezard ancien Capitaine de Marine. Gènes: Yves Gravier, 1804. "- an atlas which contains strongly engraved copper plate plans of ports and harbors around the Mediterranean. Later coloured by hand. Has many worm holes. 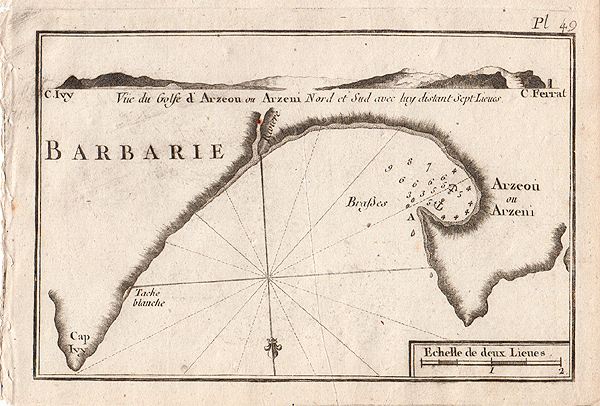 This sea chart shows Golfe d'Arzeou ou Arzen, Algeria. The chart shows depth soundings and anchorage points. Published in "Recueil de 163 des principaux Plans des Ports et Rades de la Mediterranée, dont 40 ont été derniérement publiés par Jean Joseph Allezard ancien Capitaine de Marine. Gènes: Yves Gravier, 1804. "- an atlas which contains strongly engraved copper plate plans of ports and harbors around the Mediterranean. Later coloured by hand. Has many worm holes. Oran, Algeria and Bay de Marza Quivir Roux. More Info This sea chart shows Oran, Algeria and Bay de Marza Quivir Roux. The chart shows depth soundings and anchorage points. Published in "Recueil de 163 des principaux Plans des Ports et Rades de la Mediterranée, dont 40 ont été derniérement publiés par Jean Joseph Allezard ancien Capitaine de Marine. Gènes: Yves Gravier, 1804. "- an atlas which contains strongly engraved copper plate plans of ports and harbors around the Mediterranean. Later coloured by hand. Has many worm holes. This sea chart shows Oran, Algeria and Bay de Marza Quivir Roux. The chart shows depth soundings and anchorage points. Published in "Recueil de 163 des principaux Plans des Ports et Rades de la Mediterranée, dont 40 ont été derniérement publiés par Jean Joseph Allezard ancien Capitaine de Marine. Gènes: Yves Gravier, 1804. "- an atlas which contains strongly engraved copper plate plans of ports and harbors around the Mediterranean. Later coloured by hand. Has many worm holes. 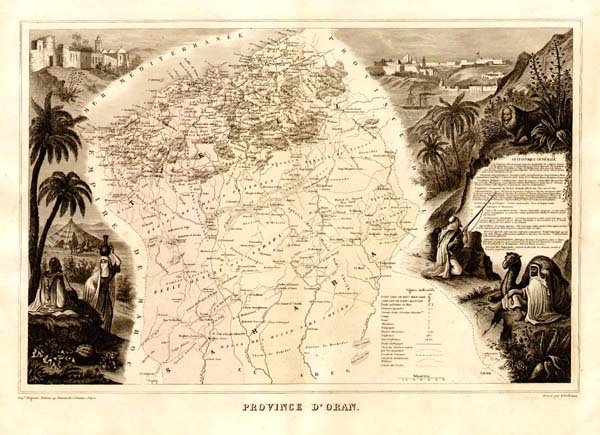 An antique map from "Province D'Oran." Attractive, detailed maps of the French regions, issued in Paris 1869 by M. Vuillemin. Each map has a small vignette view of the prinicipal town or city, plus portraits of famous people. Printed in colour, with wide margins. Some occasional foxing. Comes with text page of description. More Info This sea chart shows Bone (Annaba) Algeria and Port Geneves. The chart shows depth soundings and anchorage points. Published in "Recueil des principaux plans des ports et rades de la Mer Méditerranée estraits de ma carte en douze feuilles, dédiée à Mons.gr le duc de Choiseul, ministre de la guerre et de la Marine, gravée avec privilège du Roy, par son très humbre serviteur Joseph Roux Hidrographe du Roy à Marseille, 1764" - an atlas which contains strongly engraved copper plate plans of ports and harbors around the Mediterranean. 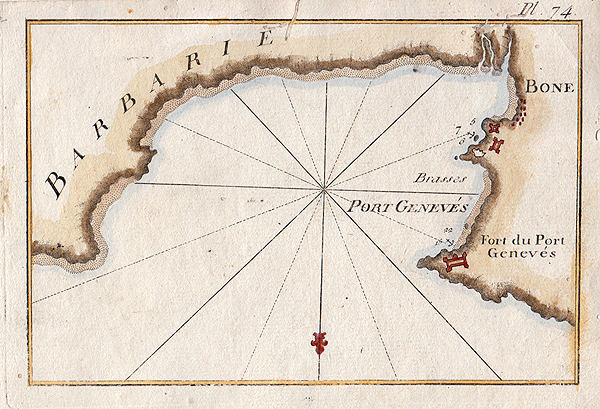 This sea chart shows Bone (Annaba) Algeria and Port Geneves. The chart shows depth soundings and anchorage points. Published in "Recueil des principaux plans des ports et rades de la Mer Méditerranée estraits de ma carte en douze feuilles, dédiée à Mons.gr le duc de Choiseul, ministre de la guerre et de la Marine, gravée avec privilège du Roy, par son très humbre serviteur Joseph Roux Hidrographe du Roy à Marseille, 1764" - an atlas which contains strongly engraved copper plate plans of ports and harbors around the Mediterranean. Vue du Golfe dArzeni Nortd et Sud ovec luij distant Sept Lieues. 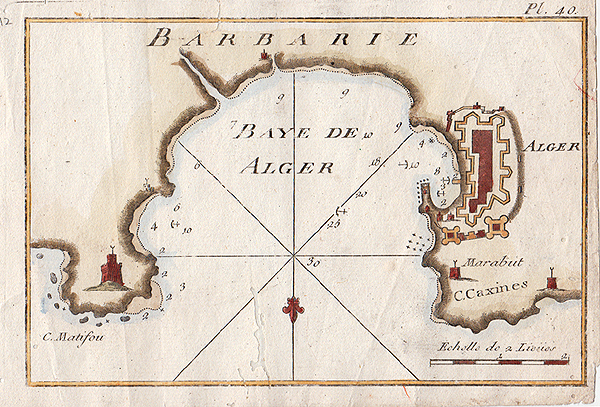 More Info This sea chart shows Golfe d'Arzeou ou Arzen, Algeria. It shows depth soundings and anchorage points. Published in "Recueil des principaux plans des ports et rades de la Mer Méditerranée estraits de ma carte en douze feuilles, dédiée à Mons.gr le duc de Choiseul, ministre de la guerre et de la Marine, gravée avec privilège du Roy, par son très humbre serviteur Joseph Roux Hidrographe du Roy à Marseille, 1764" - an atlas which contains strongly engraved copper plate plans of ports and harbors around the Mediterranean. 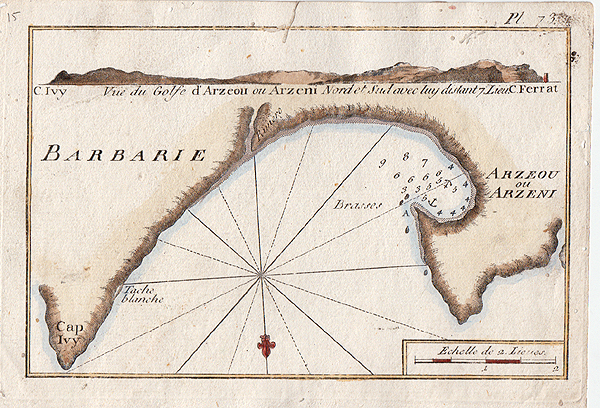 This sea chart shows Golfe d'Arzeou ou Arzen, Algeria. It shows depth soundings and anchorage points. Published in "Recueil des principaux plans des ports et rades de la Mer Méditerranée estraits de ma carte en douze feuilles, dédiée à Mons.gr le duc de Choiseul, ministre de la guerre et de la Marine, gravée avec privilège du Roy, par son très humbre serviteur Joseph Roux Hidrographe du Roy à Marseille, 1764" - an atlas which contains strongly engraved copper plate plans of ports and harbors around the Mediterranean. 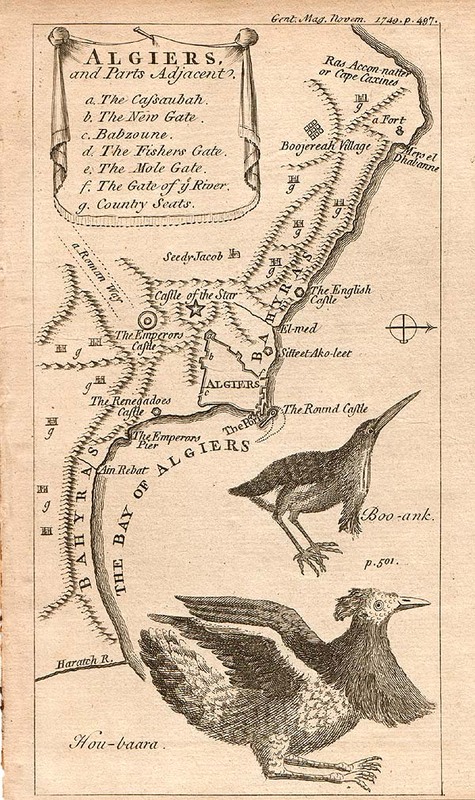 An antique map from "La France Nouvel Atlas Illustre Et Ses Colonies." Attractive, detailed maps of the French regions, issued in Paris 1869 by M. Vuillemin. Each map has a small vignette view of the prinicipal town or city, plus portraits of famous people. Printed in colour, with wide margins. Some occasional foxing. Comes with text page of description. More Info This sea chart shows Oran, Algeria and Bay de Marza Quivir Roux. The chart shows depth soundings and anchorage points. Published in "Recueil des principaux plans des ports et rades de la Mer Méditerranée estraits de ma carte en douze feuilles, dédiée à Mons.gr le duc de Choiseul, ministre de la guerre et de la Marine, gravée avec privilège du Roy, par son très humbre serviteur Joseph Roux Hidrographe du Roy à Marseille, 1764" - an atlas which contains strongly engraved copper plate plans of ports and harbors around the Mediterranean. 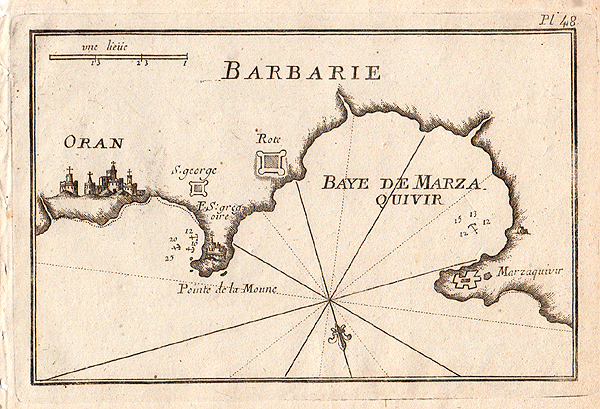 This sea chart shows Oran, Algeria and Bay de Marza Quivir Roux. The chart shows depth soundings and anchorage points. 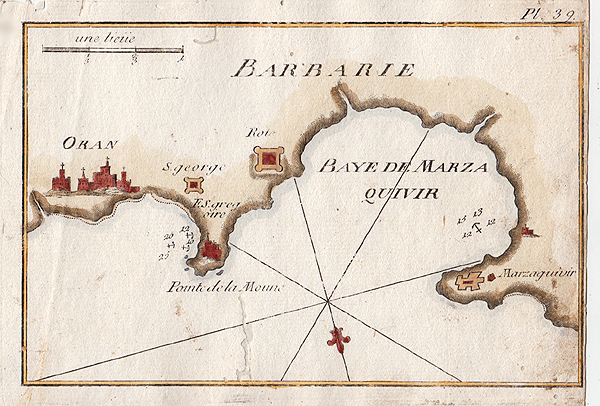 Published in "Recueil des principaux plans des ports et rades de la Mer Méditerranée estraits de ma carte en douze feuilles, dédiée à Mons.gr le duc de Choiseul, ministre de la guerre et de la Marine, gravée avec privilège du Roy, par son très humbre serviteur Joseph Roux Hidrographe du Roy à Marseille, 1764" - an atlas which contains strongly engraved copper plate plans of ports and harbors around the Mediterranean.